Well, that's pretty much all the evidence needed that they expect 3DS to be out by the end of this year. Yeah, I'm actually surprised DS hardware isn't lower than it already is. Price drop and new colors will do well. Not disagreeing, but 20.7k is the 2nd lowest week ever. 6. 22,965 - 2008-10-26 - before DSi. Just if anyone was wondering, we've lost azalyn leak, no 1st day info plus older posts are deleted. So don't expect any Xenoblade and other new releases sales numbers today. Ouch. This gets worse and worse. Wtf? I might as well kill myself. Maybe it's because Xenoblade sold more than they could track. DS has already broken the astounding 30 million LTD in Japan, so I'm guessing Nintendo don't really have much of an incentive to drop the price any further? How much is DSi/XL over there anyway? Also, there's only so many colors you can do before we get to spangly green and glittery purple. Anyway, in respect of Wii hardware, Nintendo need to bring out the big gun - a genuine bona-fide remake of Pokemon Red / Blue / Green / Yellow in full 3D. This is no time for semantics about what should or shouldn't be on a handheld. It worked for NSMB DS to Wii and it'd also work here. Ignoring the semantics involved with "should"... yes, yes it is. the heck? crikey, that's a kick in the nuts. The DSi XL retailed for ¥20000 before dropping down to ¥18000. The DSi retailed for ¥18900 before dropping down to ¥15000. The DS Lite retailed for ¥16800 before being sent to its doom under the "Open Price" banner. It'll be interesting to see how the price drop shifts the balance between the DSi LL and DSi. The price differential is now has gone from ¥1100 to ¥3000, but the DSi LL also has new colors. Before, I thought getting the DSi LL was a no brainer. It's big, but Japanese people carry bags around, so it's not like it was no longer a portable. Now, the price difference is certainly worth giving the original DSi a look again. You can put the price difference towards a new game. We are waiting for the next brave warrior. I don't think NeoGAF is killing number leaks. 2ch is far more likely. We were avoiding to post the leaked Famitsu top 50 but even then the specific leak didn't last more than 9 weeks. Posting the leaks at GAF isn't the reason the leaks go down, the problem comes from Japan. Now I start to worry if any Japanese site uploads Famitsu 2009 top 1000. It's been more than 20 days since the book came out and still nothing at YSO and geimin. I still wonder what happened to bttb. There is a Japanese idiot sending e-mails claiming he is from enterbrain but I don't think bttb was so fool to believe that. Has this ever left the Top 50 since release? I see it consistently in the 40-50 range. What is the last known numbers for it (both regular and the best edition)? It's been more than 20 days since the book came out and still nothing at YSO and geimin. Was looking back at the difference for MC's arrival and posting, and it was like 30 days, IIRC. They're likely doing the full Top 1000 at once, instead of posting 500 at a time. Just wondering, how do these leakers get found out? It doesn't seem that hard to just post to 2ch from an internet cafe. Does Famitsu purposly give Out semi-fudged numbers to sniff them out? That's what happening. They give slightly changed numbers to different groups. They can find that way from which group of subscribers the numbers leaked. The sample narrows and the process continues next week with smaller number of ''suspects'' this time until they find who is exactly the one who leaks the number. I remember before the top 30+new releases leak goes down last December I had found some small errors at one or two weekly numbers he gave. The guys who leak the data should probably change the numbers too (slightly). They'd have to know which digits were manipulated, otherwise it'd result in nonsense edits. I once used the same trick to catch a site that republished numbers and titles from my MC thread posts in a different format w/o citing. I don't think anyone has much to worry about with Geimin. If there were a problem, they would have gone down ages ago. So now that we have one less leak, we're gonna drop to 2 pages? This is the dullest part of the generation. No major games, the major games that are released are sequels, no hardware movement. Just a snoozer. Thanks, that's awesome, DS has probably broken the 200k barrier by now, bodes well for DS2. Did I miss something? When did Stumps become a mod? Congrats, anyway. I could see next weeks thread being lively, no matter which way Xenoblade goes. So, we don't get real NPD anymore. We don't get first day Japan sales anymore. where's schuelma? Is he ok? Ugh, was hoping for some Xenoblade numbers. Oh well. This is what MC threads where like when I started reading GAF in 2004. Just wait, pretty soon we'll have the 3DS and things will get exciting again. I hope so, though I imagine its (in my opinion) near certain success will be much less of a surprise than I imagine the DS was way back when. It succeeding won't be a surprise, but it could wind up doing downright historic numbers, and that would be plenty exciting. The early 3DS days will probably result in a lot of software that wouldn't sell at this point in the generation selling well, too. 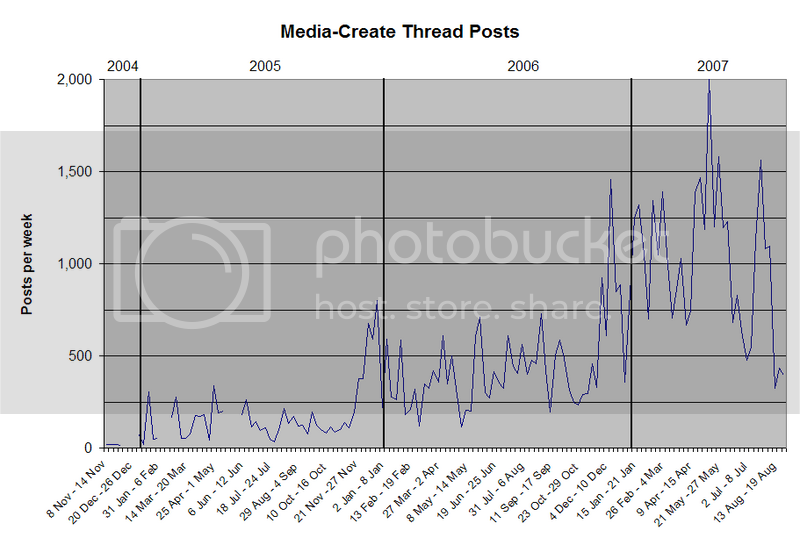 Haven't updated the online graph in a while, but you can see the 2004 MC levels still. It succeeding won't be a surprise, but it could wind up doing downright historic numbers, and that would be plenty exciting. If you showed me that and a DS sales chart next to each other they'd be hard to tell apart, I think. No good back catalog besides BC? Check. That's actually what I'm expecting from the 3DS, plus region locking. Opiate too it seems, going by the red Username on the forum main-page. It was bad enough for Yoboman with me and Dragona being mods. Now with stump and charlequin as well, I wonder if he'll post in MC threads ever again.